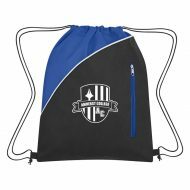 This custom logo non-woven Peyton Sports Drawstring Backpack is a perfect choice for any marketing event! With a large imprint area to display your company name and logo design, this classic promotional drawstring backpack is made of 80 gram non-woven coated water-resistant polypropylene and features a front zippered pocket and drawstring closure. Great giveaway at company picnics, golf outings, theme parks, schools, outdoor events and more. Order today! 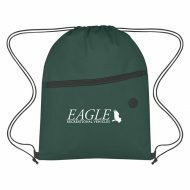 This non-woven custom logo Drawstring Sports Backpack with front zipper makes a great promotional gift for students, athletes, and employees alike! 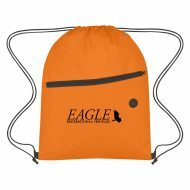 Constructed of 80 Gram Non-Woven, coated water-resistant polypropylene, and available in an array of colors, this backpack features a drawstring closure, a large front zipper pocket and a built-in slot for earbuds. For enhanced brand exposure, this drawstring backpack comes customized with an imprint of your company name and logo. Get the attention of the audience with this budget-friendly backpack! Order today!